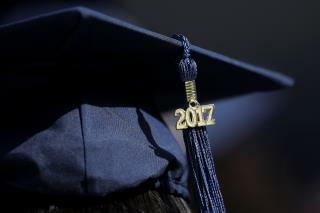 (Newser) – Honor roll students Shadi Adi Najjar and Artem Ziberov were to walk across the stage at Northwest High School in Germantown, Md., on Tuesday to accept their diplomas. Their absence instead put a solemnity on what should've been a celebration. Hours earlier on Monday night, the teenagers were killed in a storm of gunfire as they sat in a parked car about 7 miles from their homes in Germantown's Montgomery Village, report NBC Washington and the Washington Post. Audio from a home surveillance system captured more than 22 shots fired. Police found Najjar, 17, at the wheel of the still-running car shortly before 11pm. He was dead, as was Ziberov, who would've turned 19 on Thursday. Time will tell but my money is on a drug deal gone bad. The "good kids everyone loved" are usually the ones you can score a quick 1/8th from at the football game.